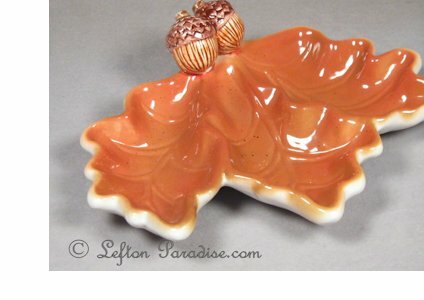 Oak Leaf-shaped Divided Dish - Homespun Autumn Discounts Apply ! A Homespun Autumn dish with three sections, each an oak leaf and decorated with a handle of acorns. It measures 8.6 by 10.5 inches and 2.5 inches deep to top of the acorns. It has no cracks or chips.